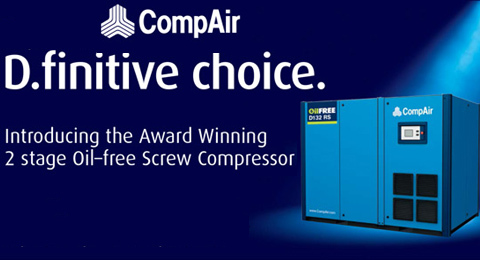 CompAir were honored with the 2013 Frost&Sullivan Award for Product Leadership for its D-Series 2-stage oil-free screw compressor. Each year, Frost & Sullivan presents this award to the company that has demonstrated innovation in product features and functionality that provides enhanced quality and higher value to customers. The award recognizes the rapid acceptance such innovation finds in the marketplace. The award product - D-Series 2-stage oil-free screw compressor, with its advanced packaging design, is ideal for use in applications within industries such as food and beverage and pharmaceuticals and electronics, where air purity is critical.